Sydney McCloud entered her first year as a student at Drexel with two goals: to make connections and to make an impact. Like many freshmen, McCloud explored student organizations determined to find a group that she knew represented her values and provided her with the sense of community she so desired. After learning about Drexel Women in Business – also known as DWIB – and working with the group her freshman year, McCloud was moved by their mission and impact and applied for a position on the organization’s executive board that same year. Reminded of the commitment to service that her mother instilled in her family as a child, McCloud wanted to see the organization make more of an impact and extend its reach far outside of Drexel’s campus. “At the time, there were no events centered toward the community. We would collaborate with organizations, but there was nothing that made DWIB stand out as a whole, and that was a role that I thought would be beneficial to the board,” says McCloud. During her time, she has grown the organization’s membership, increased the number of community outreach events, and plans to expand even more. “This year I’m changing a lot of things in DWIB, and I’m really excited for the coming year,” says McCloud. But despite such an active involvement in Drexel Women in Business, another organization gave McCloud the support she needed as she navigated three co-ops and a heavy course load: LeBow BRIDGE. 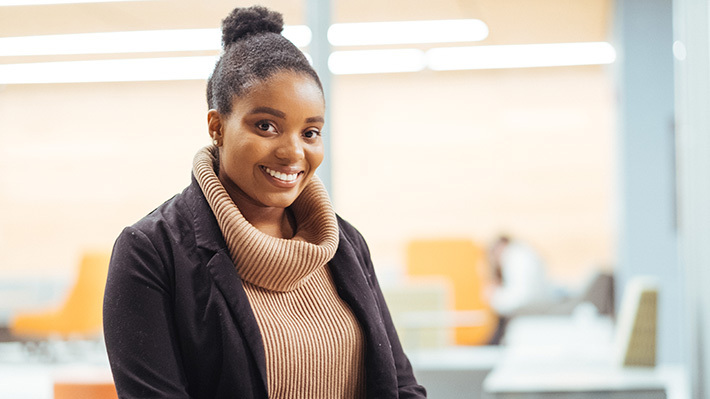 McCloud joined BRIDGE after her first year at the University and quickly found a resource for support and guidance that she had previously found unmatched. McCloud credits BRIDGE with helping her form a feeling of home while at Drexel through staff support and student connections. Today, McCloud is currently working as a Global Finance Business Processes Intern after working with the company for a year as a Cloud Project Management Intern. “Working with SAP was a great opportunity because within six months, the co-op showed me which career path I wanted to take going forward,” she says. McCloud’s active presence in student organizations and continued work with SAP is all in service to yet another goal on her horizon. “I want to leave Drexel well-rounded and to be knowledgeable in every field of business,” she says. She will begin a position as a technology consulting analyst with Accenture upon graduation.